The Spot GPS Satellite Messenger contest is finally over. The winner is Pete from comment number 25. As per the Spot GPS contest page the winner was chosen at random using Random.org. Pete now has 48 hours to respond to my email or a new winner will be selected from the participants. We greatly appreciate all those who entered and we look forward to everyone’s entry in future GPS For Today giveaways. Have you heard that we are giving away a SPOT GPS Satellite Messenger for free? There are a lot of different ways that people can use this powerful, one-way communication device – but by and the large the most popular is to use it when adventuring out in the wilderness. The following is a little video put together by the folks over at Wired.com where they field tested the SPOT GPS Satellite Messenger is a faux wilderness scenario. The film is very well made and show cases the useful of this device under certain conditions. It is certainly worth a watch for anyone not familiar with the device or for someone who wants some verification that the device works like it is supposed too. This contest has officially closed. Want to win a free SPOT GPS Satellite Messenger with one year of service? Then you have found the right place. All you need to do is leave a comment at the bottom of this post saying why you would like to win and you are entered into the contest. If you want more ways to win, just head over to our official contest page and check out the four more things you can do to increase your chances of winning. If you make use of them all, you can have a total of 74 different chances to win! This is an extremely powerful and useful personal GPS tracking device that can be utilized by many different people in many different situations. One of the main reasons for this versatility is that it works 100% off of satellite technology, making it usable in conditions where most GPS trackers will not work. It is especially great for those with a love for the outdoors since their adventures can often take them far from family, friends, and society. Send a SOS/911 message. If you are in a serious accident or situation this one button call for help can be, quite literally, a life saver. Send a Help message. If your situation is not dire but you need some help from a friend then you can notify them of your need with the press of a button. Check in with loved ones with an ‘Ok’ Message. Send a custom messages back to your family with your GPS determined location. 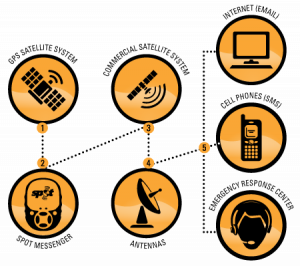 With four distinct ways to communicate with someone, the SPOT Satellite GPS Messenger is very useful tool to have out in the wilderness for extended periods of time. Remember, if you want to win the simplest way to enter is to just leave a comment below briefly explaining why you want to win a second generation SPOT GPS Satellite Messenger. If you want additional ways to enter to increase your chances of winning check out the ways to enter this giveaway. The frosty winds of winter are upon us and what could warm our hearts more than being able to recharge a GPS tracker miles from civilization while giving ourselves a nice little boost in warmth as well? Well, that is a silly question (obviously) because there are a lot of other things that would warm our hearts much more than that. Like puppies. Or sitting down to a meal of Mexican food with Conan O’Brian. Or the thought of standing way up on the observation deck of the Eiffel Tower and motioning that you want to get down by slithering down the steps like a snake. All those might warm your heart when stranded and overtaken by the delirium of frost bite. But if your are getting a warmed heart from one of these things you probably would have benefited from a jacket designed to keep you warm and recharge various electronic devices, including your cold weather GPS tracker. The name of this magical jacket is Refugium and it is currently being sold by Mountain Hardware for $230.00 MSRP. From what I could tell from a quick glance through the online retailers offering this product they were all selling it at a price between $229 and $230. I have to admit that the name sounds pretty cool to me. Refugium. I almost immediately get the image of a wandering individual on a snow encrusted mountain surrounded by silence and the death of winter. From the looks of things, he stands cold and alone – the enemy of a season that strips the earth bare to make it new again. But on the inside of his protective shell the man enjoys the warmth of his man-wrought refuge. A lightweight power source fills his Refugium with warmth derived from countless hours of ingenuity combined with the slow plodding of man into the technological age. But not only that, his Refugium also keeps a wide variety of his personal electronic devices well charged as well. Cell phones, MP3 players, digital cameras, and GPS tracking devices all can get some much needed energy love from this mobile power and heating system. Woah. Did I just lump GPS tracking devices in the same category as personal electronic devices as mobile phones, iPods, and cameras? Does that even make any sense? There are a few good reasons why a GPS tracking device would pair wonderfully with a jacket like this. The most obvious reason would be that of survival. Outdoor adventurers usually do not take a break from their adventuring just because there happens to be 4 feet of snow on the mountain. They still want to do the next big thing. If they are going to be out in the wilderness for prolonged periods of time chances are they are going to take a GPS tracking device with them, especially if they have friends and family who are concerned for their safety. And if they are using a tracker it is probably going to be a satellite GPS tracking device since this type of tracker does not rely on a cell phone network to get its location information out to friends and family. After all, there is not very much cell phone coverage on Mount Whitney, Mount St. Helens, or Mount Everest. But there is access to the sky, which is home to the satellites used in the GPS system and the commercial communication satellites used by such tackers as the SPOT GPS tracking device. If you are a serious outdoorsman whose adventuring takes you far and afield from the hard crust of civilization then a safety device like a satellite tracker is going to be one of your best friends in the event of an emergency. It might work something this. An adventurer is out in the midst of the beauty of nature when a storm suddenly approaches. He is still on the face of the mountain, exposed to the storm as he traverses a particularly treacherous portion of his journey. The driving snow causes his dangerous journey to become downright perilous as the cold weather begins to attack his footing and the sensation in his extremities. Blinded by the sheet of white falling steadily, our adventurer misses his next step, falls, and badly injures himself. After a brief effort to try and find a safe haven to weather out the storm our adventurer resigns himself to endure the rest of the storm in the open and activates his cold weather GPS tracker in the hope that the signal is going to break through the terrible storm that is surrounding him and allow him to contact some rescue personell. He really does not feel like he had much time since he can feel the warm liquid of his life blood running down his leg. Unfortunately, the storm is interfering with his GPS’ ability to get a signal from the Global Positioning Satellites as well as the commercial communication satellites that his GPS uses to find its location and to communicate with the authorities. After a few hours trying to find a trace on his position, the adventurers’ cold weather GPS tracker is beginning to get dangerously low on power. If his device looses power then it is all over for him as he slowly bleeds to death on the mountain. Luckily, this is not the end for our GPS adventurer. 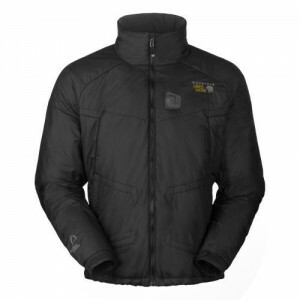 He is wearing this Refugium cold weather jacket with its portable power supply. He docks his GPS into the power supply port and is able to get a few more hours out of his GPS tracking device. This is just enough time for the storm to dissipate enough for his SPOT GPS tracker to get a strong enough signal to find its location in the world and to make contact with a communications satellite. The authorities are notified and within a few more hours our adventurer is rescued. While this is kind of an extreme example, I think it does make the principle extremely clear about how a jacket like this could be used to make GPS tracking last longer in the coldest and harshest of conditions. It also exmplifies why it might be a better idea for individuals using such a jacket system as they engage in dangerous activities to forgo using it on frivolous items like cell phones (which do will not work in remote areas), iPods, or digital cameras and to instead use it to keep their cold weather GPS tracker alive and active. One elderly man is very happy that his son had his SPOT GPS tracker with him when an ATV accident on an annual hunting trip left him unconscious and bleeding from the head. The accident, which occurred in August this year, came just two days after the unique tracking device was active by his son. The SPOT GPS tracker is a stand alone real time GPS tracking device that works in a way different from most tracking devices. Instead of relying upon a cellular network to get its position data out so that it can be tracked it uses commercial satellites to relay this data to interested parties. It is also specifically designed for outdoor enthusiasts who get away from civilization and cell phone signals. It has a specially designed 9-1-1 button that will notify local rescue authorities that you are having an emergency and that you need assistance. You can imagine how useful this feature is for people who in need of assistance when they are miles away from civilization. Clarence Kolcun was 8 km away from base camp when he lost control of his ATV and rolled the vehicle on top of himself. When his son, Gordon, got to the scene of the accident his father was unconscious and bleeding from the head. Unable to adequately treat his father, he woke him up and drove the 8 km back to the base camp to retrieve the SPOT GPS tracker so that he could activate the 9-1-1 feature. Twenty minutes after the 9-1-1 button was pushed, the Kolcun family was contacted by search and rescue authorities who inquired about the details of the men using the tracking device as well as some other identifying information like the make and model of their vehicle and the color of their ATVs. This is by and large the strongest selling point for this type of GPS tracking unit. Being able to mobilize help in such a short time span is paramount in being able to survive an accident. Clarence was unable to move and could sense that he suffered from internal injuries. If there was no SPOT GPS tracker then help would have arrived much later than it eventually did. As you might expect, the emergency personnel were able to locate the injured man and his companion and they were air lifted out of the bush so that the injuries of the injured could be treated. This device is absolutely fantastic as an SOS GPS tracker. Because it does not rely on cell phone signals it is able to work in a wide variety of circumstances that would not normally be possible with conventional tracking units. This story is just one of the many different situations where a product of this nature did save the life of hunter, hiker, climber, or camper – and it certainly won’t be the last. This means that if you are on an adventure in Australia and you find yourself lost and stranded in the Outback without water and food all you need to do is press your 9-1-1 SOS button and you are going to know that the authorities are going to be notified of your need and given your GPS coordinates sot that they can find you and provide the help that you need. This type of GPS tracking system is certainly not cheap. As you can see, the device itself costs around $100 – but that is not the end of the cost associated with this device. For 1 year of basic service you are going to have to pony up another $100. While this may seem like a lot right now, I am sure that when something catastrophic happens then it will seem like nothing! When it comes down to it, the vast majority of people are not going to need a device like this. Thousands upon thousands of people go out into the wilderness each year and come home without incident. They simply do not need a GPS device that tracks their movements and alerts family members of their whereabouts. It is superfluous for these people. But then every year there are dozens upon dozens of individuals or groups that could definitely benefit from this type of tracking capability. They have a very serious injury in their party and the difference between life and death can only be a matter of minutes. It is for these people that the SPOT Satellite GPS Messenger are some important for. Who will these people be? If you have an elderly person in your hunting or camping party, it could be you. Or if you have young children on your back packing trip, it could be you. If you have a first time climber going up the mountain with you, it could be you. If you attempting a dangerous route, it could be you. The thing is, it could be any of us at any moment. We just never know when a stray rock is going to slide off a mountain and strike one of our companions, or a wild animal decide to attack, or a freak weather phenomena blows away all your gear. Anyone could need the help of a SOS GPS tracker. That is why we need to walk with out eyes open when we make these types of trips out into the wilderness. If we have weighed our options and decided that we don’t need the assistance of a GPS tracking device to give us the extra sense of security then we should not buy one. But when we want that little extra comfort of knowing that help is only a button away – that is when getting a SPOT GPS tracker is the right move. Finding a quality, real time GPS tracking device that is going to work in the rugged outdoors is a top priority for campers, climbers, and outdoor adventurers. The SPOT GPS Tracking Device tries to meet this need for this particular market. The problem with many of the other traditional tracking units is that they suffer from a reliance upon the cell phone networks. When you use the SPOT Satellite GPS Messenger you don’t need to be in cell phone range for the device to work, making it perfect for those who adventure well off the beaten path. The obvious reason for this being a desirable trait in the tracker is one of safety. Even if you have the best of the best in tracking equipment but it is unable to transmit your signal over a network so that others know where you are your tracking equipment is useless. It is money thrown down the drain. The SPOT GPS avoids this serious pitfall by relying upon commercial satellites instead of cell phone networks to communicate its data. The process begins with GPS satellites broadcasting a signal containing information that a GPS device can use for trilateration. The SPOT Satellite GPS Messenger receives these signals from its GPS antenna and process the information in its onboard GPS chip. This process is again called trilateration and is the bedrock of all effective GPS tracking. It then sends this position information to commercial satellites to move along the chain. Once it receives your message, the communication satellite will then relay it back down to earth for one of the satellite antennas to pick up. These satellite antennas are connected to a global network that will route the information generated by your SPOT and send a central processing station where it can be stored and then communicated via the methods you selected. The whole design of this system is really quiet remarkable and I am really surprised that more personal GPS tracking devices do not utilize this technology. As you can clearly see, coverage is best in North America, Europe, and Australia. East Asia also has good coverage and so does the northern portion of South America. One additional word about the coverage – this is map focuses on step 2 and 3 from above (SPOT and satellite communication). That means that if you are in a place where you cannot get a GPS signal then you are not going to be able to use it to track your location or use it to contact emergency personnel. 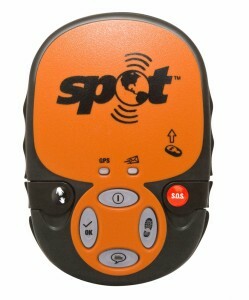 Pre-order the SPOT 2 Satellite GPS Messenger – Orange (PRE-ORDER) now! Sometimes our driving takes us to paths that do not get cell phone reception. At such times it becomes important for us to have a way to successfully notify emergency personnel in the advent of a car crash or other medical emergency. Services like OnStar are simply not going to cut it since they rely heavily on cell phone networks to transmit their information. [SPOT helped save an ] elderly man with chest pains on the remote Alaska Highway of British Columbia. With no phone service, Gary Sleeper used his SPOT Messenger to alert the Emergency Response Center that he was in an emergency situation and needed assistance. This small GPS tracking device has a large impact on this family that day even though it was being used in an uncommon way. One very common application of GPS tracking is for children. You see it in a wide range of devices and ideas. The features of the SPOT GPS that would lend itself well to this application are the SOS button, the Help button, the Check-In/OK button, and Custom Message button. Have three different ways to communicate with your child makes it much easier for them to communicate accurately with you, their parent. SOS button – This would obviously be used for the worst case scenarios. If you child is hurt, in an accident, or kidnapped they should press this button. This will notify you and the authorities about your child’s location. I’m not certain the that the police will be notified per se, but at least you know some government agency will be. Help button – This is designed for non-emergencies and to notify parents of your need for help. Is your child lost on their way home? Are they stuck at school because you forgot to pick them up? Are they stranded at a county fair because they got seperated from the pack? These would all be proper uses of the Help button. Check-In/OK button – This could be used by a kid who is wanting to let their parent know that they got to school, baseball practice, or a friends house okay. It could also be a way for them to let you know that they have been thinking of you and just wanted to say I love you. Custom Message button – You can make up to three custom messages with the SPOT GPS tracking device. Use your imagination or discuss with your child how these three messages should be used and what their content should be. While this sounds like a great candidate for use as a child tracking device there is one major concern that one should be aware of. It is that the device is fairly large when compared with some of the smaller child tracking devices like the Amber Alert GPS. The larger the device, the more likely it will be discovered and discarded in the event of a kidnapping. This is the exactly the situation in which you want your covert GPS tracking device to stay hidden! This is a going to be a very uncommon use of this device, but I thought it was so interesting that I’d put it down anyway. Imagine a very rich man who travels around a lot but has certain things that he wants constantly – like chocolate or massages. He has hired a bunch of people to cater to his wishes but he doesn’t want to drag an entourage with him every single time he is out on the town. A man like this just has to take a long a SPOT GPS tracking device and he is no more than a button away from delicious chocolate or a relaxing massage. Once he presses the help or custom message button his people will be notified of his express desire can be dispatched forthwith to cater to his every need! Now that is living in the lap of luxury. If you are interested in purchasing the the SPOT Satellite GPS Messenger then you can pre-order it using the link below. This product is expected to ship sometime in October 2009. An elderly man was saved by the Spot GPS Tracker after having a very serious ATV accident that left him unconscious. Luckily, the man’s son had a SPOT that he has just recently activated. Within minutes of the accident the 9-1-1 button was pressed and emergency personnel were notified of the distress signal. Shortly after that a rescue team was on the scene and the injured man was taken by helicopter to the nearest hospital. This just goes to show you the power of a GPS tracking system when adventuring in the great outdoors!